Imagine yourself walking through an apocalyptic 1950s Hollywood. An ominous wind howls down empty streets. A bone white moon hangs in the sky. The unsettling calm is replaced with the the sound of engines revving and tires squealing. The moon turns to blood. The scraping of shuffled feet draws near. In seconds you’re surround by pompadour-bedecked greasers and buxom undead vamps with low cut tops and the worst intentions. The upright bass begins to thump out a rhythm. Guitars wail. You don’t seem to mind that your brains are now becoming a meal. For the undead rockabilly / psychobilly set amongst you, get yourself prepared to rock with the Cold Blue Rebels. Blood, Guts, N’ Rock & Roll is the brand new release from straight from Hollywood’s freshest dug graves. 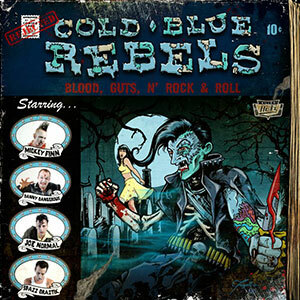 Musically, the Cold Blue Rebels (CBR) run the psychobilly spectrum from the Stray Cats sounding, “Cold Blue & Beautiful” to a more straight up punk sounds of “Brain Food” and the Mad Sin-esque tones of “Drenched In Black”. Frankly it is nice to hear this amount of variety in what can often be a rather one-trick-pony sub genre. 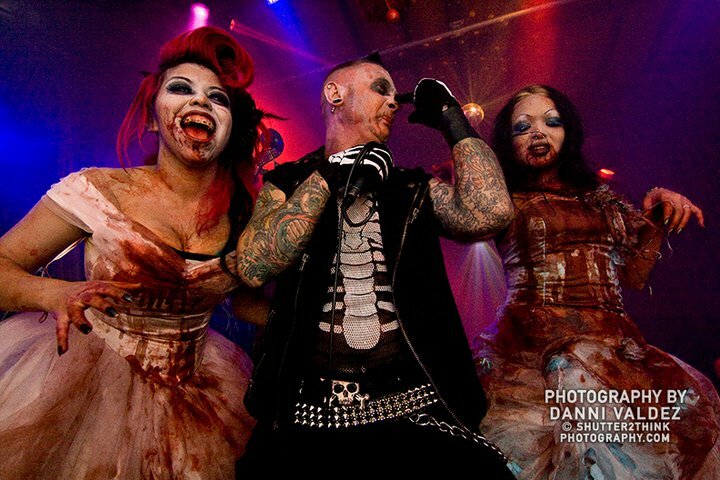 Blood, Guts, N’ Rock & Roll does have, for better or worse, the trappings of the genre: zombies, zombie hookers, death, blood, gore, presented in a 50s horror film style. For what it’s worth though, a good part of the charm of psychobilly is the revision of the rockabilly culture with the horror kitsch spin; fast cars, fast guitars, switch blades, and the undead. … you know, right? Pound for pound a damn fine effort for a bunch of undead.